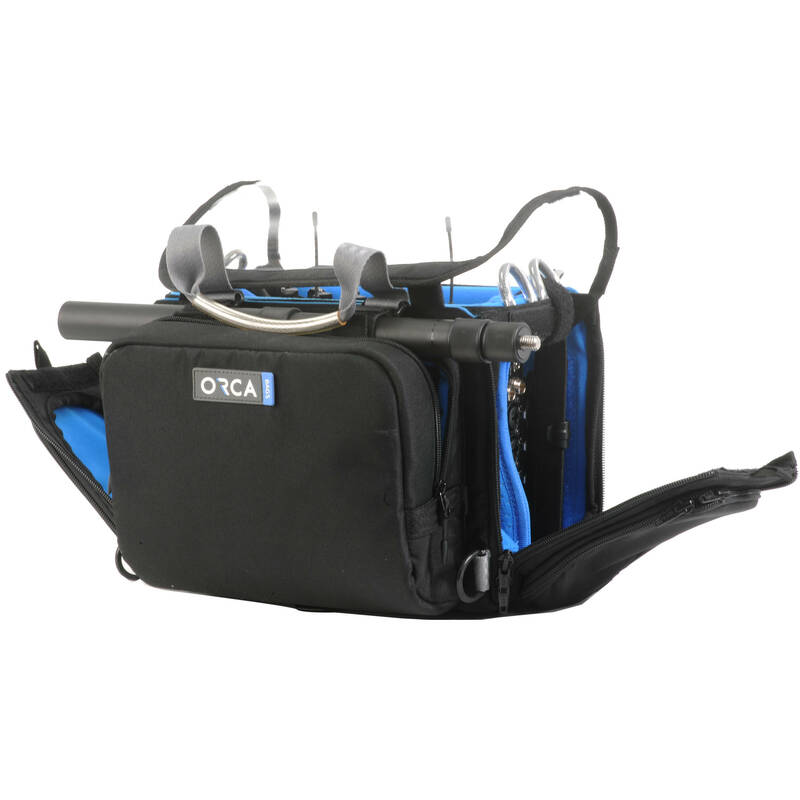 The Orca OR-280 Audio Bag is designed to fit MixPre-10 audio mixers or other similarly sized mixers. It features an internal honeycomb frame which can securely hold your recorder/mixer, as well as other gear such as wireless transmitters and battery mounts. Internal sponge lifts and a divider allow you to arrange your gear as needed. The bag has a transparent top to easily view your equipment which is secured by a hook-and-loop strip. There are also hook-and-loop straps to secure a boompole or cables on the outside of the case, as well as straps to secure gear inside the case. The bright blue polyester interior allows you to view your equipment clearly. The OR-280 is accessible from multiple angles, allowing you to access and arrange gear however you choose. Two zipper pockets on the side and one large pocket in the front provide space for additional gear such as headsets, cables, and batteries. The bag is carried by two handles or by the included shoulder strap, and it is also compatible with the optional Orca Harness if you need to keep your hands free. Box Dimensions (LxWxH) 12.0 x 12.0 x 10.0"
OR-280 Audio Bag for MixPre-10 Mixer (Extra-Small) is rated 5.0 out of 5 by 1. Rated 5 out of 5 by Kevin from Well built solid bag I have barely used this bag so my review is based on first impressions. I have a couple camera bags for gear, but this bag is a step above in terms of quality. I feel like I could drop this bag without worry about the contents being damaged. It is rugged and I suspect it is on par with their other bags for audio recorder use. This is my first Orca but I am blown away. As for the fit of the MixPre 10t, it fits, but I am new to this sort of setup, with only a MixPre 10t to my name, no lav mics, battery packs, etc at this point. There seems to be good room in the bag for extras no doubt. The one gripe I read about all other bags and the reason this big is made for MixPre 10t is the DC input plug on the bottom. This bag has a holder on one side that lifts the recorder up a bit so that there is room for the DC input plug without it being bent/broken off. I havent tried it out yet, but it looks like enough room for a straight on DC connection. I bought the DTAP to DC plug, and it fits fine in the bag, no bend/snag to it. There is enough room on both sides to access all the ports. I can even get to the dial, as small as it is, and I have big hands. All in all, I think there is no better bag for the MixPre 10 at this point. This is the bag to get if you own that recorder. The official Orca website says this bag is compatible with the Mix-Pre 10 along with the MX-L battery mount. Does this mean it will fit two NP-F970 type batteries mounted at once?